When it comes to comedy, delivery is everything. 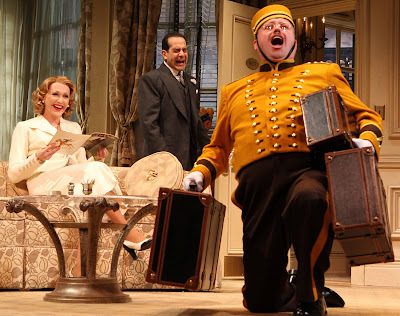 The cast of Lend Me Tenor makes that clear in every single scene of the hilarious play written by Ken Ludwig and directed by Stanley Tucci. Set in a hotel suite in Cleveland, Ohio, in 1934, the stage is divided into two elaborately decorated rooms. The atmosphere is vibrant and classic, costumes similarly glamorous, and the tones of the actors appropriately melodramatic. When neurotic Cleveland opera producer, Saunders (Tony Shaloub), hires the world renowned Italian tenor, Tito Morelli (Anthony LaPaglia), to star in Othello, he expects him to arrive on time and be ready to perform. Max (Justin Bartha), his daughter, Maggie’s (Mary Catherine Garrison) foolish boyfriend, is his assistant and responsible for ensuring that Tito is focused on the premiere. The three, expecting him to arrive solo to his hotel room, are surprised to find him finally enter with his hot-tempered wife, Maria (Jan Maxell). She proceeds to yell at her husband for eating too much on the way and accuses him of having women in the hotel room. Saunders leaves Max to convince him to take a nap. Max secretly mixes a tonic in his drink to do the trick, totally ignorant of the fact that Tito had already taken pills in an impassioned response to his wife‘s bickering. Completely intoxicated, Tito even has Max sing to him after Max tells him about his own vocal ambitions. He finally falls asleep, distraught because he finds out moments before that his wife has left him. When Max attempts to wake Tito, he finds him completely still and panics that he is dead. He informs Saunders, who goes mad with rage because he thinks of the tickets that must be refunded. He devises a plan to have Max sing the tenor’s part and wear the costume for Othello, with blackface and all. He would fool the audience and the company until having to announce Tito’s death early the next morning. “Nobody will know,” he convinces the reluctant Max. Little do they realize that Tito is still alive. It’s one farce after another and the actors do a tremendous job of refreshing the humor. A play of operatic proportions, Lend Me Tenor, is a surefire hit. Each role, large or small, has its own flair and the dynamic between the characters is well balanced. The actors truly compliment each other, making the play an arena for witty verbal jousting. 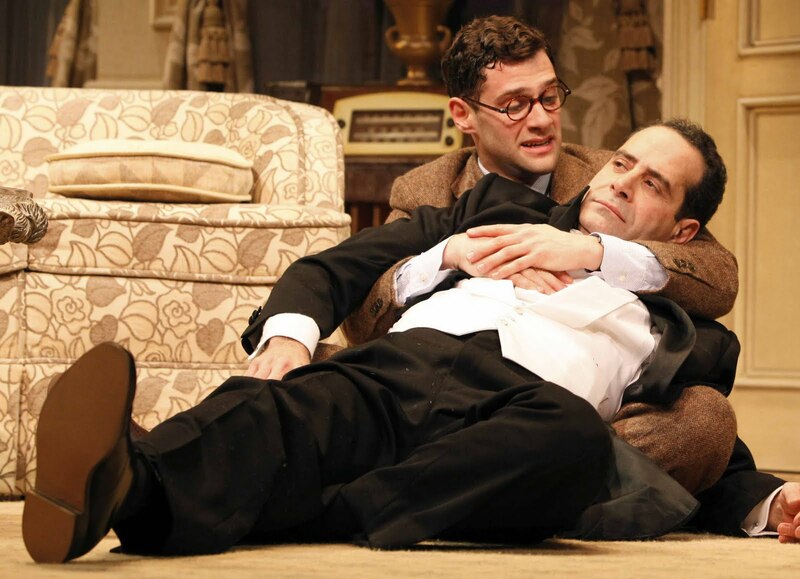 Lend Me Tenor is simply genuinely funny and suitable for all audiences. TICKETS: $26.50 general rush • Music Box Theatre, 239 W. 45th St.